Orla Kiely’s autumn/winter 13 presentation was sheer retro perfection, from the tops of the models’ dishevelled beehives to the tips of their shiny shoes. And as soon as I clapped eyes on said shiny shoes, I knew I had to track down a pair for myself. A little sartorial detective work told me the beautiful patent T-bars were in fact from Kurt Geiger’s sister range, KG by Kurt Geiger. Meet Daphine. With her round toe, retro T-bar, buckle fastening, chunky mid-heel and high-shine patent finish, it was love at first sight – the perfect balance of unashamed girliness and ladylike elegance. 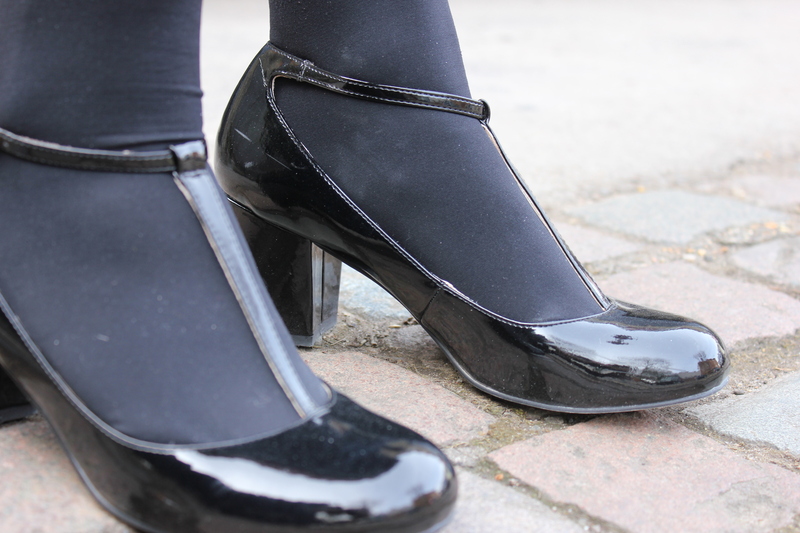 Toe-tapping T-bars have got to be the most fabulous footwear legacy of the 1920s. Hot on the heels of Baz Luhrman’s adaptation of The Great Gatsby, which premiers at Cannes Film Festival next month, all things ’20s are set to go stratospheric. Gatsby is one of my all-time favourite reads so needless to say I can’t wait to see it – and I’m sure this won’t be the last you’ll hear of it on my blog. For me it’s style references and details – rather than the full-on look – that make a Gatsby homage more fashion forward than fancy dress. These KG shoes certainly fit the bill and add a dose of understated glamour to any look – the perfect partner for feminine dresses as well as more tailored ensembles. I was extra pleased with my find as I managed to put a £20 gift voucher towards my purchase, courtesy of Elle magazine’s March issue. I took my shiny shoes out for their first spin at my cousin’s wedding last month (more on my outfit to come soon). I certainly felt as glamorous as the models at Orla Kiely’s show and the mid-heel and soft leather meant my tootsies were perfectly comfortable too. For their next outing I quite fancy pairing them with a pair of white tights – à la Orla Kiely AW13. How would you wear them?